This is true. Respect for all cars enthusiasts, no matter what they drive. @TheJimmyRustler, thank you sir. Idk why tuners argue muscle. I have a turbo subaru and a hemi 300c and love them both. Can't we just all get along. Car guys unite! Reply with your dream car. 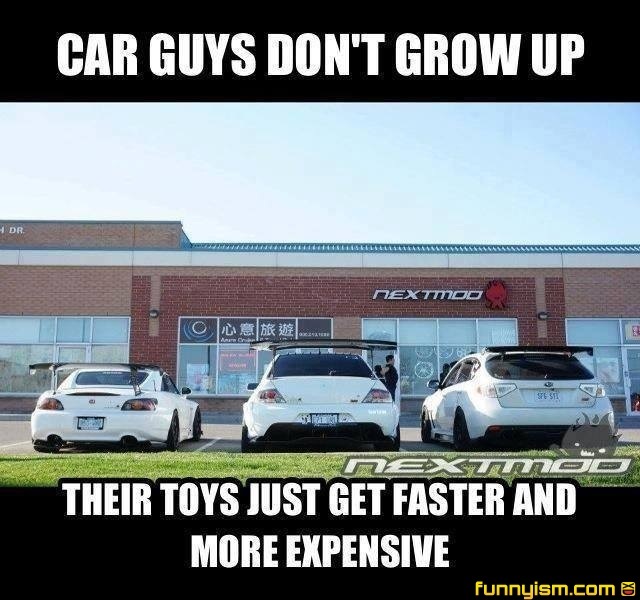 Mine would probably be a Rocket Bunny kitted 2JZ swapped 240SX. @Psykotik, I'll take real horsepower 69 Dodge charger with a supercharged 440 Magnum. @Psykotik, Nissan Silvia S15 with stock SR20DET directly from Japan. I love the rocket bunny 240SX! @Psykotik, I also know someone (rich guy) who has an 1800 hp Ford F-150 Lightning with a tri-turbo Aventador engine and three nitrous bottles. Runs an 8.4 1/4 mile. @averagejoe918, as long as you don't say a lambo you're fine. @Psykotik, I daily 1 of them, they weren't really made for baby seats. @Dragoon, I have a 69 Camaro SS with an LS1 swap, 6 speed manual, posi and full flowmasters. @Dragoon, do you live in Washington state? @KraigKasala, unfortunately I do not, I live in Nebraska. I'll just have to make do with my 02 Mustang Gt with a high lift cam, coil overs, injectors, intake, shortie headers, off road x-pipe and Borla ATAK cat back, and a diablosport tune! But their dicks don't change at all, and there's where the problem lies. @nissanfanboy, R32? Cmon i think we would all enjoy a R34 the most! @Scottish Zyzz, I do love it but it watched initial d and really started thinking about the R32! Plus they are legal in the U.S.! @The Oldest Guy Here, I seriously doubt that. You realize that's an STI, right? @Meatwad Sprite, maybe a civic hatchback. These are legit. Rear spoilers on front wheel drive cars, GENIUS! @Boomboom99, That actually makes sense. The transmission is in the front as well as the motor which makes the back end even lighter and more likely to slide, the spoiler creates the downforce to keep it planted. Btw, none of those cars are fwd. You obviously aren't a car guy because I've always driven rwd cars and I can tell you it actually does make sense. @DyslexicWolf, evo is awd optional and you can turn on awd. S2000 is rwd all the time and sti is awd all the time. @The Vagician, I concur, car nerds, unite! @SWAT, someone lied to you, all Evo are AWD only or you can get a FWD Lancer that isn't Evo. There's no AWD controller on the Evo. @JinHoshi, ok I looked it up. I'm man enough to admit when I'm wrong, so my apologies. @JinHoshi, I'm embarrassed since, although I've never owned one, it's my dream car. I know all about the type of engine and drivetrain and active yaw control and whatnot. I can tell you how much torque abd hp each generation has. I thought I knew that it was 4wd optional, but apparently I don't know as much as I thought. But eh, whatever. Its a sick car, so kudos for having owned one. So why aren't there any fast expensive cars in the pic? All 3 are less than $60,000 kids in my town ARE driving these. At least find a pic of some exotics. And car guys are assholes. You forgot to mention that. @Pong, people who call other people assholes without meeting them are assholes. I hope you get down votes so much that your phone explodes. @nissanfanboy, You literally just verified my comment. I drive a 370z how about you? S2k, Evo, and an STI? Dream garage.. Mine become crappy and unreliable...but still expensive...*lies in a pool of tears and gasoline.